The Liverpool Readathon is back- bigger and better… and Knowsley schools can join in! 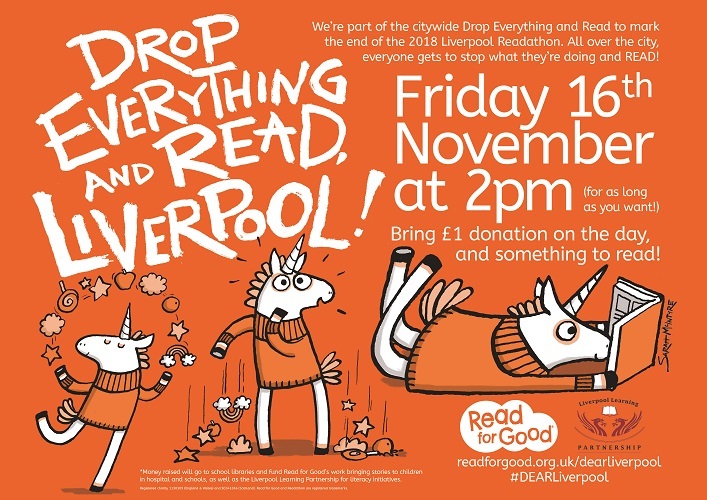 This year’s Readathon, organised by Liverpool Learning Partnership and Read For Good runs from 5th-16th November 2018 and is set be a fortnight full of reading and book-related fun. There are special guest authors and a citywide Drop Everything and Read planned… it’s all getting very exciting! The Liverpool Readathon works on a traditional sponsor card model, where children can set goals and then be sponsored for reading whatever they want. However, this year, there will also be the option for schools to take part based upon a donation model- where pupils in the school can make a one-off donation to Read For Good in return for taking part in Drop Everything and Read sessions and other activities. 20% of money raised can be used to buy books for your school library; 10% goes to support Liverpool Learning Partnership’s wider work on reading for pleasure and the remaining 70% funds Read for Good’s unique programme bringing a regular supply of books and storytellers into the UK’s major children’s hospitals including Alder Hey Children’s Hospital. Each school will receive a Readathon kit containing sponsor cards, posters and resources. Sign up by 29th October to receive your free kit.